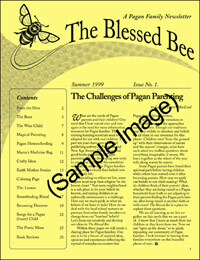 The Blessed Bee - Year Seven (#25-28) [bb-7] - $11.95 : BBI Media - Magazines that feed your soul. The Blessed Bee #25 The Heart of Lammas · Pagan Family Values: Summer Fun In Your Neighborhood · From Dad’s Desk: Summer Family Projects · Crafty Ideas: Adorn Yourself With Crafts Made From Nature · Song Circle: Lammas Bread Bleassing · Earth Mother Lore: Idunn & the Golden Apples · Introduction to Runes: Change, Rebirth, & Protection · Making Bread for Lughnassad · The Sleepless Mother as Shaman · A Moment in Nature · Mabon the Autumn Equinox · Singing with the Ancients, Singing with the Innocents · Praying with Gaia · Babies, Toddlers, & Sweet Mother Nature · 30 illustrated pages. Edited by Lauren Foster MacLeod. Published in Summer 2005. The Blessed Bee #26 Granny Cosby’s Table · Big Daddy Witch: Back on the Broomstick · Magickal Food: Samhain Sweets · Crafty Ideas: Nature Walks Inspire Crafts · Song Circle: Hallowe’en is Coming · Earth Mother Lore: Wendy Wyrdwitch & the Sunflower Pumpkin · Introduction to Runes: Runes for Knowledge · Teen Witchery: Witches in the Media · Transitions: Using Ritual to Cope With Loss · Raising a Pagan Child & Being Raised Pagan · Blessings That Teach Gratitude · Feeling the Holidays · The Enchantment of Youth · 30 illustrated pages. Edited by Lauren Foster MacLeod. Published in Autumn 2005. The Blessed Bee #26 Live & Let Learn · Pagan Homeschooling: A Witch Is Her Word · Big Daddy Witch: R Is for Routine · Magickal Food: Comfort Food for Winter & Wild-Crafted Food for Spring · Crafty Ideas: Make Brighid Crafts for Imbolc · Song Circle: Body Song · Earth Mother Lore: The Tall Tree – A Love Story · Introduction to Runes: Runes for Money · Teen Witchery: Witchcraft Is the New Black · The Search for Spring · Spirituality & Disability · Ostara Eggs, Naturally! · Successful Passage · Sisterhood: Across Generation & Across Races · 30 illustrated pages. Edited by Lauren Foster MacLeod. Published in Winter 2006. The Blessed Bee #28 Harmonizing With the Dissonance of Life · Pagan Homeschooling: Being a Pagan Homeschooler When Your Kids Aren’t Pagan · Big Daddy Witch: We Are Family · Magickal Food: Queen Titania’s Fairy Cookies · Crafty Ideas: Make Shadow Puppets for Spring · Song Circle: Beltane Processional · Earth Mother Lore: The Cub Who Went Hungry · Introduction to Runes: Runes for Travel · Teen Witchery: Practical Magic · Creating Perwinkle Fairies · Stinging Nettle · Birth: Not Pain, But Peace & Power · Finding Joy in the Path Taken · So You Want a Tattoo? Try Henna Body Art! · 30 illustrated pages. Edited by Lauren Foster MacLeod. Published in Spring 2006.